Summary: In 1989, services comprised no more than 10 per cent of Cuba’s export revenues, with sugar accounting for over 70 per cent. In 2007, by contrast, it was sugar that made up 10 per cent of overseas earnings while services accounted for 70 per cent. The article provides an overview of this drastic decline in Cuba’s merchandise export sector — principally sugar — and explains the inability of the island’s non-cane agriculture to compensate for the collapse of the sugar agro-industry from 2000 to 2007. The dramatic expansion in the export of services by 2007 eliminated Cuba’s balance of payments deficit in merchandise trade. This was partly due to growing gross revenues from tourism but more importantly from the export of medical, educational and technical personnel to Venezuela which repaid Cuba for her services in both hard currency and favourable terms of trade for oil. In turn, it was the deployment of many thousands of Cuban medical and educational personnel that enabled President Chávez to fulfil his key social ‘missions’ to provide free public health and education to Venezuela’s underprivileged majorities. Cuba’s unrivalled capacity to train appropriately equipped medical and educational personnel to serve in deprived communities overseas is explained, with Venezuelan finance permitting their wider deployment in Central and South America and the Caribbean. In conclusion, Cuba’s current economic dependence on the continuance of Venezuela’s political and social policies is stressed together with the importance of offsetting this by improving the poor performance of Cuban agriculture. As an island economy with limited natural resources, Cuba’s economic well-being has been powerfully shaped throughout the 20th century by fluctuations in the structure and profitability of her foreign trade. This was amply demonstrated in the years following 1989 when dramatic changes in Cuba’s international trading conditions decimated activities in her traditionally dominant merchandise export sector — sugar — while stimulating a remarkable countervailing expansion in her export of professional services. This article seeks to identify the principal forces at work in the displacement of commodity exports by services in Cuba’s international trade, while critically examining the role of the state in the management of this transformation. The island’s persistent agricultural problems are highlighted as inhibiting Cuba’s pursuit of greater economic independence. In the 1990s as in the 1930s, Cuba’s economy foundered on the changed fortunes of one commodity — sugar. In 1985-9 more than two thirds of her total sugar exports were absorbed by the USSR and East European members of COMECON, the latter purchasing an annual average of one million tonnes. By 1993, however, Eastern Europe’s purchases had plummeted to some 50 thousand tonnes. And while the Soviet Union and its successor republics in the CIS generally maintained their demand over the same years, their purchase prices were cut well below the premium levels obtaining up to 1991. The generous Soviet credits that had financed Cuba’s long-standing deficit on her balance of payments current account were also curtailed. Within the overall deterioration in the terms of trade in the post-Soviet era, those for sugar and oil were particularly severe. In 1987, for example, one tonne of Cuban sugar exchanged for 4.5 tonnes of Soviet crude oil and derivatives, but in 1992 one tonne of sugar was bartered for only 1.8 tonnes of Russian oil. As a consequence, while there was only a modest fall in the volume of Cuba’s sugar exports between 1989 and 1992, their foreign exchange earnings fell from nearly 4 billion pesos to less than1.5 billion pesos. The collapse of Cuba’s export earnings, and with it the island’s import capacity, was the dominant cause of the rapid fall in gross domestic product, employment, investment and popular living standards in what was euphemistically termed the ‘Special Period’. Exacerbated by a tightened US trading embargo that further restricted Cuba’s foreign trade, the bulk of the island’s shrunken revenues from sugar exports were perforce deployed to finance imports of basic necessities such as food and fuel. In consequence, the productive capability of the sugar economy itself was gravely damaged. During the 1980s, stimulated by the profitable and expanding markets of the Soviet bloc, Cuba’s sugar production had risen to an historically unprecedented annual average of close to 8 million tonnes. This reflected the comprehensive transformation of Cuba’s traditional practices of cane growing and harvesting. Cane yields were increased, primarily via increased applications of agro-chemicals and more irrigation; and key operations in the cultivation, harvesting, cleaning and transshipment of the cane had become increasingly mechanized. Together with an expansion of milling capacity, such advances from ‘backward’ to ‘modern’ technical practices substantially increased the productivity of both land and labour. But operations in Cuba’s new productive system thus became more import- intensive and highly interdependent and, as the imperative needs of national economic survival slashed the share of foreign exchange earnings that could be allocated to sugar’s agro-industry, both production and efficiency deteriorated. Cane yields fell sharply as imports of agrochemicals — especially for fertilizers and herbicides — were drastically cut; and processes of cultivation, harvesting, cleaning and transshipment were all disrupted by shortages of fuel, lubricants, replacement machinery and spare parts. Milling efficiency declined, partly because of breakdowns in industrial equipment but more by disruptions in cane-supplies of deteriorating quality. Interruptions at any point in the sequence of harvesting and transshipment operations created backward and forward bottlenecks that could paralyse the entire cane delivery system. The inevitable result was a costly under-utilization both of industrial capacity and of the formidable array of machinery, equipment and labour deployed in cane harvesting, cleaning, and transshipment. When combined with the inadequate replanting of increasingly exhausted plantations and the enforced continuance of harvests in adverse weather conditions, such factors explained the collapse, between 1991-92 and 1992-93, of sugar production from 7.1 million tonnes to 4.4 million tonnes and exports from 6.4 million tonnes to 4.0 million tonnes — a fall for both of almost 40 per cent in a single year. In 1993, the crisis of production in the sugar economy prompted major structural reforms in the cane-growing sector. From the late 1970s, encouragement had been given to the formation of ‘Peasant Production Cooperatives’ (CPAs) which unified the holdings of many individual private farmers. These were afforded generous state assistance in the form of credits and access to agricultural machinery and other necessary farm inputs. Substantial material assistance was also provided for infrastructural improvements and the construction of new housing and on-farm schools. CPA productive performance substantially improved on that of cane-lands in the agro-industrial enterprises (CAIs) owned and administered by the state and which continued to dominate national production up to the early 1990s. After the disastrous harvest of 1993, however, the Cuban Sugar Ministry (MINAZ), no longer disposing of the necessary material inputs effectively to manage large-scale cane-growing itself, leased the bulk of its plantations to the workers previously employed on them and, together with such other members as they could recruit, these were reorganized in new ‘Basic Units of Cooperative Production’ (UBPC). It was hoped that these enterprises — though still subject to diverse centralized controls — would, like their compatriots outside state-administered agriculture, be better able to cope with ageing farm machinery and equipment and would compensate for shortages of other import-intensive inputs by more labour- intensive cultivation practices. Particular stress was placed on the deployment of oxen in lieu of tractors, with more diligent manual sowing and weeding partially offsetting shortages of imported agro-chemicals. Drastic reductions in imported foods and animal feeds in the worst years of the Special Period brought severe national and regional food shortages and a key objective in establishing the UBPCs was their potential for supplementing (but not substituting for) their cane production by growing staple foods such as rice and root vegetables for on-farm consumption and for local marketing or exchange. Accompanying such reforms were repeated statements of official policy to restore sugar production to its pre-crisis levels. However, given the sustained dearth of imported resources required to restore cane yields and to maintain the national park of agricultural and milling machinery and equipment, compounded by poor management and falling labour productivity, such a policy objective was never feasible and harvests from 1993-94 to 1999-2000 produced an annual average of only 3.9 million tonnes. From 1996, however, there was a slow but steady process of general economic recovery. The acute shortages of foreign exchange had prompted a reluctant encouragement of the tourist industry with an increasing number of joint ventures, notably with Spanish enterprises. Nickel production was modernized and expanded with the deployment of Canadian and other foreign capital. There was increased activity in oil exploration and extraction in association with such overseas oil companies as were willing and able to resist US pressure. And China’s role as an investor and trading partner grew in importance. A decisive boost was given to the recovery process with the election of Hugo Chavez as President of Venezuela, providing Cuba with a politically sympathetic new trading partner that could act as a source both of hard currency and of favourable terms of trade for oil. If Cuba’s general international economic prospects seem to have improved, it was abundantly clear by 2002 that substantial increases in the level and productive efficiency of sugar production would require major new investments of foreign capital. Given poor prospects for significant or sustained increases in international sugar prices, no such investment programme could be justified and the official policy of seeking to restore sugar output to pre-crisis levels was therefore formally abandoned. Instead, in 2002 a ‘restructuring plan’ formalized and further accelerated an existing process of mill-closures. Of a nominal total of 156 sugar factories, only 104 had been active in the 2001-02 harvest and it was proposed to reduce this number to 85 (including those manufacturing only cane by-products and derivatives). About 100 thousand workers would be laid off, half in industry and half in agriculture. It was reckoned that the concentration of production in a smaller number of mills, grinding cane from better-quality plantations, would sharply reduce unit costs. Higher yields in both field and factory would also compensate for any initial fall in production, with production stabilising at around four million tonnes and with prospects for future increases should there be a substantial improvement in market conditions. It was evident that the success or failure of this plan would depend on the speed, scale and skill with which it was carried out and on whether scarce inputs hitherto deployed to poor productive effect in now-defunct mills and plantations could be more effectively utilized to increase field and factory yields in those remaining active. In the event, the plan was implemented more swiftly than was initially announced, on a larger scale and in an organizational context of considerable disorder. Moreover, there was nothing to suggest that yield-improving productive inputs were transferred from newly-closed mills or abandoned plantations to the smaller number of active mills and the reduced cane area. As can be seen in Table 1, the outcome over the harvest years 2001-02 to 2006-07 was a fall in sugar production from 3.6 million tonnes to 1.2 million tonnes. And cane yields per hectare harvested, reported to be an unsatisfactory 33.3 tonnes in 2001-02 — down from an average of some 54 tonnes during the 1980s — averaged some 30.2 tonnes from 2002-03 to 2005- 06, increased applications of fertilizer and better weather conditions boosting yields to 36.1 tonnes in 2006-07. The most positive performance indicators that could be noted were that the average of lost milling time (due to breakdowns, cane shortages, rain) was lower in the more recent harvests than the former, together with some improvement in the recovery rates of sugar per tonne of cane ground (Anuario Estadístico de Cuba 2006, X.3, X.5). As was to be expected, the restructuring plan for the sugar economy was accompanied by estimates of substantial compensating increases in activity in non-cane agriculture. In November 2003 a target of 246 thousand additional hectares of diverse food crops was set, together with 15.3 thousand additional hectares of citric fruits orchards, and the national area under forests was to be extended from 23 per cent of the total land to 29.3 per cent. No precise figure was given for the expansion of the area under pasture but it was stated to permit the national cattle stock to be increased by 500 thousand head. Despite the drastic downsizing of the sugar economy, however — the harvested cane area was more than halved, falling by no less than 700 thousand hectares, between 2001/02 and 2006/07 — aggregate non-cane agricultural production virtually stagnated during the same period. As reported in Table 2, there were significant variations in production for different crops with better or worse weather conditions affecting performance for particular years. (Drought, for example, depressed both cane- and non-cane production in central and eastern regions between 2003 and 2006, and better weather conditions in 2007 were offset by massive hurricane damage in 2008). But this could be accommodated at least in part by comparing (rounded) data for the annual average production of 2001-03 with that of 2004-06. 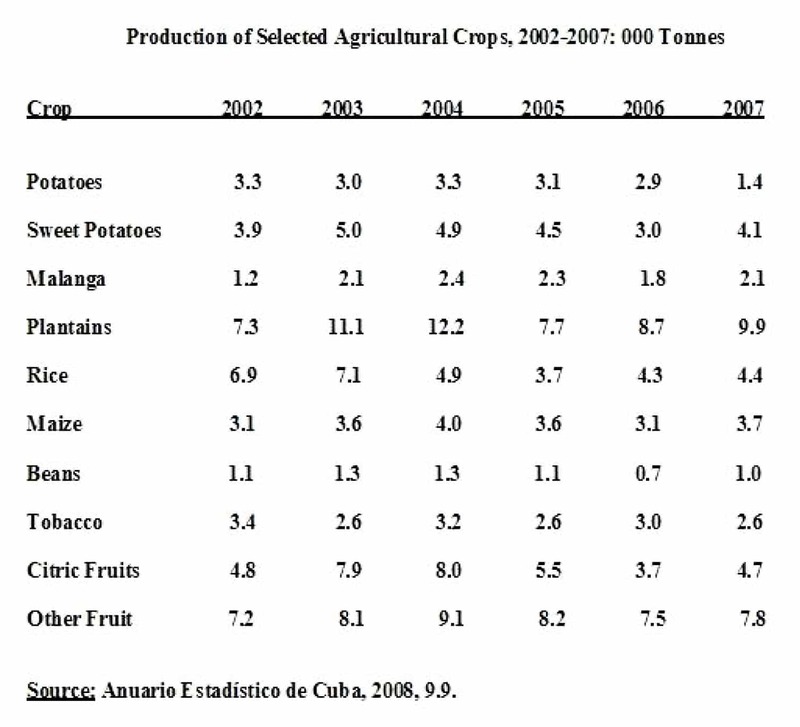 Data derived from the Anuario Estadístico de Cuba (2006, IV.2) showed an increase of about 10 per cent in the production of root crops and non-citric fruits, being offset by a fall of 20 per cent or more in both cereal production and citric fruits. Average production of beans and tobacco also fell. As regards livestock, there was a significant increase in the number and weight of pigs slaughtered, but this was accompanied by a fall of similar magnitude in the number and weight of slaughtered cattle. And while egg production increased by one-fifth, chicken production for the market fell by the same percentage. Milk production was reportedly some 30 per cent lower over the years 2004-06 than in 2001-03. Finally, over the same period, there was a fall of 18 per cent in fish and seafood production. 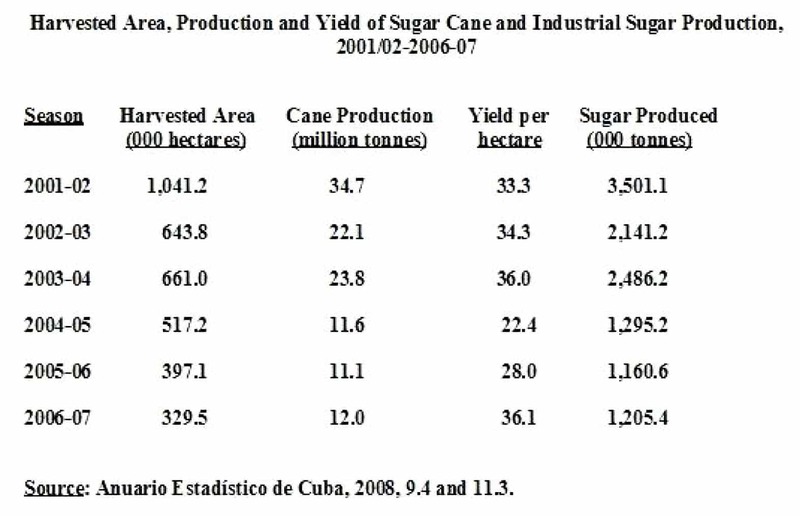 As shown in Table 3, both the decline of Cuba’s sugar economy and the accompanying stagnation of her non-cane agriculture impacted severely upon her export earnings from sugar, tobacco, other agricultural products and fisheries. Over 2001-03, these earned an annual average of 735.3 million pesos. Over 2004-06, however, such earnings fell by 27.1 per cent to 536.4 million pesos. Table 4 shows that by contrast — and in partial consequence — the value of her imports of food products and livestock rose from 782.8 million pesos per annum over 2001-03 to 1,202.7 million pesos over 2004-06. The latter was an increase of no less than 53.6 per cent (Anuario Estadístico de Cuba 2006, VII.7, VII.10). To put the matter in starker perspective, while Cuba’s sugar exports alone could finance the island’s total food imports some four times over in 1989, during the years 2004-06 her exports of sugar, tobacco, other agricultural products and fisheries combined could not finance even one half of her food imports. Why was Cuba apparently unable productively to divert the abundant quantities of land, labour and capital previously engaged in the sugar economy so as substantially to improve the performance of non-cane agriculture? The explanation offered here is necessarily brief but it must begin by stressing the intractability of both human and material resources locked up in the sugar economy on the eve of ‘restructuring’. Sugar factories themselves, of course, are specialized productive enterprises of no obvious alternative use and the principal value of the many mills closed down consisted in their potential as suppliers of second-hand replacement parts and equipment for those remaining active. Secondly, with the notable exception of tractors and trucks, the machinery and equipment deployed to harvest, clean and transship the cane was also highly specialized and cane-cleaning stations, chopper harvesters and cane-loaders had little if any alternative use outside the sugar economy. The productive potential of much of the land previously under cane was also limited, most being suitable for the extensive grazing of cattle rather than the intensive production of food-crops. The declared redundancy of 100 thousand workers within the sugar sector seemed at first sight to release much additional labour for agricultural work. But industrial workers in newly closed factories make unwilling unskilled agricultural labourers and the specialist operatives of cane-loaders and harvesters would not gladly exchange such employment for manual work with machete or hoe. Hence generous compensation packages, with continued full pay and opportunities for further education or re-training, were offered rather than a pressured redeployment of skilled field and factory workers into onerous, low-productivity activities in non-sugar agriculture. There is little doubt that the speed, scale and poorly organized nature of restructuring the sugar economy was accompanied by the demoralization of much affected labour: in December 2006 the Commission for Economic Affairs of the National Assembly’s report on agriculture noted “a decline in labour productivity and also in the average hours worked”. Moreover, the bulk of the land diverted from cane farming remained within the administrative jurisdiction of the Sugar Ministry. The managements of state and UBPC cane-farms had limited experience in food production and the administrative methods that might be appropriate where the practices of growing and harvesting cane are necessarily subordinated to the needs of the sugar factory could be quite misplaced for the cultivation of a variety of food crops. Unsurprisingly, the Commission Report noted not only declining labour productivity but “subjective deficiencies” and “negative factors” in management (as quoted in Granma, 25 December 2006). It was evident, also, that acute shortages of yield-increasing productive inputs, notably in agro-chemicals, continued to depress general agricultural performance. Restricted irrigation capability inhibited the expanded cultivation of basic food crops while exacerbating the impact of drought upon natural pasture. The latter in turn magnified the effect of scarcities in imported animal foodstuffs. At the same time, the progressive ageing of the nation’s stock of trucks, tractors and associated farm machinery continued to contribute to high breakdown rates and excessive repair and maintenance costs. It was notable that in 2006, of the total of trucks available to the state agency for the procurement and distribution of agricultural produce — the Acopio — some 40 per cent were reportedly out of service and the 60 per cent in use were reportedly 20 years old or more (Granma, 25 March 2006). Poor agricultural performance, with increasingly burdensome food import costs, has been recognized by the Cuban authorities. From July 2008, landless workers were authorized to rent up to 33 acres of uncultivated state-owned lands and established farmers and cooperatives could also rent such land providing their total holdings did not exceed a maximum of some 100 acres (Granma, 18 July 2008). This was an important measure that recognized that private or cooperative agricultural producers could increase aggregate production where the state was failing to do so. But in addition to needed increases in the share of state-owned agricultural land actually under cultivation, urgent measures were also required to improve state performance in the production, collection and distribution of food crops grown by individual or cooperative farmers. Here there were many public complaints of inefficiencies and losses by the responsible state authorities. There were shortfalls in promised inputs, notably in animal feedstuffs. Farmers complained of tardy payment for crops collected. Delays in collection resulted in the deterioration or loss of perishable harvested produce. Shortages of containers affected collections. Accurate weighing of purchased produce was often made impossible by an insufficient supply of simple scales. And at state agricultural markets there were complaints of inconsistently priced produce and of product losses through poor storage (Hagelberg and Alvarez, 2007). In the context of Cuba’s overall economic performance, the gravity of Cuba’s agricultural situation was masked to an important extent by the extraordinary growth of services in the island’s overseas earnings. 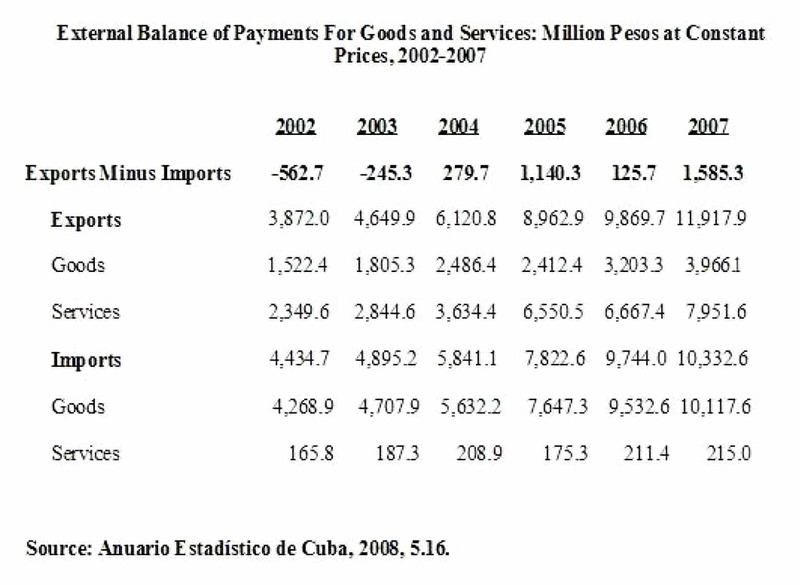 As Table 5 indicates, in 2007, Cuba’s balance of payments deficit on merchandise imports and exports totalled over 6 billion pesos. However, in the same year this was effectively eliminated by a balance of payments surplus for services reported to be some 7.7 billion pesos. The Cuban statistical system is coy about the disclosure of a number of economic relationships (including up-to-date information on the performance of the sugar sector) and published data on the remuneration received by both individuals and the state for professional services rendered overseas are unavailable. It is known, however, that while total gross tourist hard currency earnings in 2007 amounted to some 2.2 billion pesos (Anuario Estadístico de Cuba 2007, 15.11), this comprised less than one-third of the total foreign earnings then classified as services, with net earnings (after deductions of the major hard currency expenditures incurred by the sector) being substantially lower. There is no breakdown of the remaining reported balance of well over 5 billion pesos but there is little doubt that the bulk of it corresponded to hard currency payments made to the Cuban state by Venezuela for services provided by medical, educational and technical personnel. Most of these were employed in Venezuela itself, but the latter’s burgeoning oil revenues also financed a significant number of Cuban professionals working in other countries in Central and South America. By 2007, Venezuela was also Cuba’s most important source of merchandise imports. Comprised principally of oil, and totalling 2.2 billion pesos, these were more than five times the value of Cuba’s merchandise exports to Venezuela in the same year (Anuario Estadístico de Cuba 2007, 8.5, 8.6). The importance of the growing economic relationship between the two countries stemmed from Hugo Chavez’s inauguration as Venezuela’s President in 1999. On assuming office, President Chavez announced a number of key social ‘missions’. One was to provide free public health services to the mass of Venezuelan citizens living in deprived urban or isolated rural areas and without access to, or unable to afford, professional medical assistance. Another was to implement a mass literacy and basic education programme for the substantial proportion of the adult and child population lacking basic schooling. One obvious feature of both missions, a spectacular one in the sphere of public health provision, was the inability or unwillingness of Venezuela’s own professional classes to participate on any significant scale in their implementation. Venezuela’s medical profession in particular belonged to the country’s well-remunerated middle class, and lived mostly in a comfortable urban environment. They did not work — never mind live — in the shanty towns of Caracas or amidst deprived rural communities. While Cuba’s ability to export commodities had been shattered by the exigencies of the Special Period, she maintained and further expanded her capability to train and export human capital in the form of medical, educational and other professionals. In 1989, according to figures published by the UN’s Economic Commission for Latin America and the Caribbean (ECLAC), Cuba’s budget allocations for health and education totalled 2.6 billion pesos and were reported to be 2.8 billion pesos in 1997. In telling contrast, over the same years expenditures on defence and public security were cut from 1.3 billion pesos to 733 million pesos (ECLAC, 1997, Table A.7). This reflected long-standing state policies that prioritised the roles of health and education in the process of economic and social development and to which Cuba, since 1959, had allocated proportionately more resources than any other developing country. Between 1959 and 1961, about half of Cuba’s doctors and dentists left the island, forcing the implementation of a crash programme of medical training both to make good the loss and to extend medical and dental provision to the country’s neglected rural areas. Then, in the 1970s, the nation’s university system was expanded to include all the country’s 14 provinces. Newly created faculties of medicine provided free education for students drawn from the regions in which these institutions were located. The outcome was an increased medical training capability that not only permitted a steadily improving ratio of doctors per head of Cuba’s population but increased the island’s ability to send medical personnel to work overseas as well. By the 1980s, Cuba had more doctors working in Africa, Asia and Latin America than the World Health Organisation while at home, by 2001, she had three times the number of family doctors per head as the UK. While the state ensured that the acute economic crises of the 1990s did not affect the education system’s ability to produce a steadily increasing supply of medical personnel (between 1989 and 2006 the number of Cuban doctors doubled, from 34.8 thousand to 71.5 thousand, the number of family doctors within these totals increasing from 9.0 thousand to 33.2 thousand (Anuario Estadístico de Cuba 2006, XV.1) radical changes in the ways in which medicine was taught and practiced were necessary due to collapsing foreign exchange earnings. During the Special Period, imports of chemicals, finished pharmaceutical products and medical equipment of all kinds were slashed, and scarcities in a wide range of pharmaceutical products were exacerbated by deficiencies in hospital equipment and by disruptions in the supply of energy and transport. All this reinforced the practice of preventative medicine and encouraged the use of traditional herbal and other remedies to offset shortages in imported medical supplies. All medical personnel were perforce encouraged to improvise and to develop a wider range of diagnostic skills within an environment that encouraged everyone to make the best of what was practically available. Accompanying the provision of basic medical services was a spectacular programme for the mass provision of free sight-saving surgery. Glaucoma, cataracts and detached retinas were a notorious and preventable scourge of poor communities in Third World countries. With Venezuelan finance, Operación Milagro deployed both fixed and mobile teams of Cuban ophthalmic surgeons to provide the necessary sight-saving operations required to cure these diseases. Functioning in several countries in Central America and the Caribbean including, following the election of Evo Morales, Bolivia, over 400 thousand patients were treated by November 2006, no fewer than 290 thousand being poor Venezuelans. By December 2007, the total treated by Operación Milagro numbered one million, with continued expansion plans and facilities in place. Together with its multi-faceted medical aid programmes, Cuba also drew on its own practical and theoretical experience to assist overseas campaigns against illiteracy, once more with significant Venezuelan participation both as recipients and as a source of finance. In 1961, Cuba herself had mobilized tens of thousands of young urban students to live in the countryside teaching rural households to read and write. The methods used were rudimentary and follow-up campaigns were vital to make such initial educational endeavours really effective. Since those early days, Cuba had developed much more sophisticated pedagogical methods, linking phonemes with numbers, accompanied by audio-visual programmes in an integrated educational package. This specifically Cuban method was awarded a prestigious UNESCO prize both for its efficacy and economy and is currently practiced in more than 15 countries and has to date resulted in more than two million poor people having learned to read and write. Cuba, moreover, trained more than 600 specialists to instruct overseas anti-illiteracy campaigners in this teaching method which can be adapted for use in diverse cultures ranging from countries speaking Spanish, Portuguese and English to communities in Bolivia speaking the indigenous languages of Quechua, Áymara and Guaraní. Employing donated audiovisual and other equipment, Cuban instructors also assisted a major anti-illiteracy campaign in Nicaragua that by the end of 2006 had taught 150 thousand people to read and write. The formidable expansion of her medical and other professional training facilities has established Cuba as the pre-eminent provider of medical, educational and technical expertise for numerous Third World countries. The tens of thousands of professionals the island has dispatched overseas have proved willing and able to work in arduous conditions for costs to host countries far below those demanded by their First World colleagues. Over the period 2000 to 2007, this capability has coexisted with the emergence of a political regime in Venezuela committed to the improvement of the health and welfare of its underprivileged majorities and commanding oil revenues enabling it to remunerate the Cuban state handsomely for the services of its medical and other personnel. On the one hand, this has permitted the Chavez regime to fulfil key social missions and thereby to widen and consolidate its popular support. On the other hand, the exchange has given Cuba vital access both to oil on favourable terms and to hard currency revenues to offset the drastic decline of the earnings of its traditional commodity export sector. The exchange of Venezuelan material resources for Cuban personnel improving basic social conditions within Venezuela and beyond is mutually beneficial and, in a broader developmental context, highly laudable. But it also makes the Cuban economy highly dependent upon the continued existence and policies of the Chavez regime — in other words, on factors entirely outside Cuba’s control. The abortive coup in Caracas in April 2002 and the sustained hostility of the US to the policies currently pursued by both Caracas and Havana clearly indicate the importance to the island of enhancing, not reducing, its economic independence. Politically, recent changes in Latin America and the Caribbean, in conjunction with Cuba’s practical emphasis on exporting not revolution but the means to improve the lot of the region’s poor, have vastly improved Cuba’s political position in the Western Hemisphere. Indeed, it is the US, not Cuba, that is currently the more isolated politically. However, internally Cuba must now address much more directly and vigorously the acute problems of poor performance that are so notable in its agricultural sector. The island’s agrarian economy possesses the potential for substantial improvements in the productivity of both land and labour and critics within the island have pointed to the key problems in production and distribution that demand effective solutions. The import bill for the island’s food imports — though supporting improved domestic food consumption — is already unacceptably and unnecessarily high and volatile international food prices are likely to inflate it yet further. To date, the state has enforced a plethora of controls over production, collection and distribution partly to check the emergence of an intermediary stratum that it finds socially and ideologically objectionable. Nevertheless, the state has itself also been unable to fulfil the role of such a stratum in stimulating food production and effecting the rapid collection and delivery of quality produce to hard-pressed consumers. Agriculture has always and everywhere been the Achilles heel of the socialist economy, resistant to efficient central planning, in need of a significant degree of decentralization, and with a clear if circumscribed role for local market forces. It would be better if the Cuban state could grasp that nettle sooner rather than later. 1 The peso ceased to be officially at par with the US dollar from 1995. Cuba’s foreign trade is in fact conducted in international currencies, valued in US dollars, but her official statistics continue to report trade in Cuban pesos and this practice is followed here. 2 Unless otherwise indicated, all data from 1989-2004, originally in the Anuario Estadístico de Cuba (various years) or from MINAZ sources, are abstracted from Pollitt, 1997, 2004a, 2004b and 2005. It should be stressed that the statistical methods deployed in Cuba’s official publications have varied over time and data published in some years have been revised in others. Statistics of national food production incorporate estimates of on-farm consumption and private sale as well as official deliveries to state purchasing agencies and are thus to be interpreted with caution. 3 For an analysis of the exchange of Cuban professional personnel for Venezuelan material resources, see Pollitt, 2007. Economic Commission for Latin America and the Caribbean (ECLAC) (2007) La Economía Cubana — Reformas estructurales y desempeño en los noventa, Mexico: Fondo de Cultura Económica. Oficina Nacional de Estadísticas, Anuario Estadístico de Cuba, 2006, 2007, 2008, Havana, Cuba: ONE. Hagelberg, G.B. and Álvarez, J., (2007) ‘Cuba’s Dysfunctional Agriculture: the Challenge Facing the Government’, Cuba in Transition, Vol. 17, Washington 2007. Pollitt, B. H. (1997) ‘The Cuban Sugar Economy: Collapse, Reform and Prospects for Recovery’, Journal of Latin American Studies, Vol. 29, No. 1, 1997. Pollitt, B.H. (2004a) ‘The Rise and Fall of the Cuban Sugar Economy’, Journal of Latin American Studies, Vol. 36, part 2, 2004, reprinted in International Sugar Journal, Vol. CVII, Issue No. 1273, January 2004. Pollitt, B.H. (2004b) ‘Crisis and Reform in Cuba’s Sugar Economy’, in Ritter, A R (ed) The Cuban Economy, Pittsburgh: University of Pittsburgh Press. Pollitt, B.H. (2005) ‘The Technical Transformation of Cuba’s Sugar Agroindustry’, in Pérez-López, J F and Alvarez, J. (eds) Reinventing the Cuban Sugar Agroindustry, Lanham, MD: Lexington Books. Pollitt, B.H. (2007) ‘The New “Alliance for Progress” in Latin America’, Frontline, Vol. 2, Issue No. 3, 2007. Brian Pollitt is Honorary Senior Research Fellow at the University of Glasgow. The author wishes to acknowledge G B Hagelberg for helpful suggestions in the preparation of this article. This article was first published in International Journal of Cuban Studies 2.1 (June 2009) under a Creative Commons license. See, also, Omar Everleny Pérez Villanueva, “The Cuban Economy: A Current Evaluation and Proposals for Necessary Policy Changes” (Institute of Developing Economies, JETRO, 2009); Omar Everleny Pérez Villanueva, “Notas recientes sobre la economía en Cuba” (Espacio Laical, 2010); Marc Vandepitte, “Los desafíos económicos y sociales de la revolución cubana en 2010” (Rebelión, 23 May 2010); “Reducirá Cuba medio millón de plazas en el sector estatal: Pronunciamiento de la Central de Trabajadores de Cuba” (CubaDebate, 13 September 2010); Marc Vandepittem, “Medio millón de puestos de trabajo perdidos en el sector estatal cubano” (Rebelión, 23 September 2010).